The above editorial cartoon is important, not because it's true, but because it highlights the prevailing rhetoric that incorrectly frames the conversation. The truth is that there is no individual security without universal privacy; ask anyone of the past who was, the present who is, oppressed (German Jews under Nazis rule, blacks under south African apartheid, women in the U.S. before suffrage, blacks in this country's south before the civil rights movement), ask anyone who seeks change unpopular at the time but which was the right thing to do in retrospect. 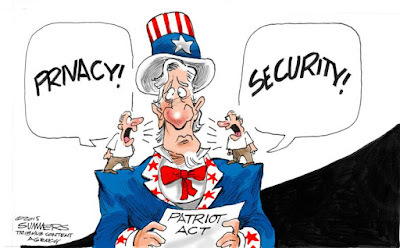 We must uphold the privacy rights of individual citizens and the collective citizenry in order to secure ourselves against the risks of our democracy being slowly and insidiously undermined. Liberty, defined as the right to be left alone, can not exist without privacy. We depend upon individual privacy and security protections to guard against invasions of individual liberty by the present activities of the state, of hackers, and of criminal and commercial enterprises. Consider for a moment what would have happened to the oppressed and unpopular groups that I mentioned, if those prior governments had the technology of today (NSA electronic surveillance, FBI low-altitude high-resolution plane-based camera surveillance of all major cities, local police use of Stingray technology that intercepts mobile phone calls and data and pinpoint locations --- all without warrants). Here's what would happen: those in power would have more effectively controlled and suppressed those not in power. Could you imagine organizing around and in support of Rosa Parks if the local police of the time had Stingray, and knew instantly any time a group of two or more black people were in one place or communicating with one another? Fewer people would have participated, and it could have changed the course of history. A society that has the tools to systematically suppress the weak or unpopular is one breath away (a reaction, a scare) from the society that uses those tools to systemically suppress the weak or unpopular. That is a more imminent danger to democracy than even the most well-funded terrorist group.